Objective: The aim of the present study was to compare the of tuberculin skin test (TST) and Quantiferon-TB gold in Tube (QTF-GIT) test in diagnosis of latent tuberculosis infection in health care workers. Methods: A total of 100 volunteers were recruited from the health care workers in our hospital. In addition to collection of descriptive data and occupational history including age, gender, occupation, duration of work, presence and number of BCG scars, also chest radiographs, QTF-GIT and TST were performed routinely in all participants. Results: Rates of positivity for TST and QTF-GIT test were 42% and 23%, respectively and there was a weak concordance between these two companion diagnostic tests (k=0.23, concordance 62.2%). In comparison to TST, sensitivity and specificity of QTF were 35.7% and 86.2%. No significant correlation was detected between presence and number of Bacillus Calmette-Guérin (BCG) scars and QTF-GIT test. In contrast, as the number of BCG scar increased in accordance with the increase in the diameter of indurations in TST. Interestingly, there was a significant correlation between TST and QTF-GIT tests. The average diameter of TST in QTF-GIT negative individuals was 11 mm, while it was 15.4 mm in QTF-GIT positive cases. Positivity of QTF-GIT was more likely as the diameter of TST indurations increased. Conclusion: We suggest that QTF-GIT test is an effective diagnostic measure for latent tuberculosis infection in countries that have high NTM prevalence and BCG vaccination ratios. However, further controlled studies on larger series are warranted to acquire more accurate results. Latent tuberculosis, Diagnosis, Tuberculin skin test, QuantiFERON-TB Gold, Healthcare worker. Tuberculosis (TB) constitutes a current risk even in lowincome countries due to abandonment of vaccination campaigns, immigration movements, and wide diffusion of immunosuppression and poor efficacy of vaccines in use. These circumstances make TB a major health problem for public health . The risk of TB infections is even higher for healthcare workers (HCWs) than the general population. Routine screening is recommended for this population [2,3]. Since transmission of disease in healthcare facilities are linked with the local prevalence of TB, the characteristics of the population and the effectiveness of infection control programs . Latent TB infection (LTBI) is a state of persistent immune response to stimulation by Mycobacterium tuberculosis antigens without evidence of clinically manifested active TB. The incidence of LTBI has been investigated via screening programs using the TST or the QFT-GIT test in different settings. According to recent publications, prevalence of LTBI ranged as 7.6% in England and 51% in Korea [4,5]. Data derived from the World Health Organization yielded that incidence of TB infection was 6.1 per 100.000 inhabitants in Cuba, while prevalences of LTBI in a community hospital and a hospital dedicated to management of TB were 15.4% and 50%, respectively [6-8]. Currently, treatment strategy for active TB remains insufficient for elimination of the disease and this insufficiency is partially attributed to LTBIs. It has been estimated that approximately one-third of the world population has an LTBI, with an annual risk of 0.1% of developing active TB . Thus, timely diagnosis and effective treatment of patients with LTBI who are under increased risk of progressing to active disease are key crucial for TB control programs. TST is one of the few tests that has been continuously used for a century in clinical medicine . It aims to evaluate the cell-mediated immunity as a delayed type hypersensitivity response to the most commonly used purified protein derivative (PPD) which peaks after 48 to 72 hours . Even though TST has been used as a traditional test method for diagnosis of LTBI in different populations throughout the world, the TST has several limitations since it uses a relatively crude mixture of antigens derived from Mycobacterium tuberculosis (MTB) [9,12]. A well-recognized limitation of TST, which impairs the effectiveness of TB preventive strategy, is the presence of false negative results, especially in immunocompromised patients, or false positive results mainly due to the cross-reactivity of the TCT with the Bacillus Calmette-Guerin (BCG) vaccine strains and with most environmental non-tuberculous mycobacteria (NTM) . Recently, interferon-gamma release assays (IGRAs), such as QFT-GIT have been introduced in clinical practice for detection of LTBI . Meta-analysis data had shown that IGRAs have excellent specificity and correlate well with the magnitude of exposure to MTB . The aim of the present study was to compare the efficacies of TST and QTF-GIT in diagnosis of LTBI in HCWs and to assess the correlation between these tests and risk factors for the disease. This study was implemented over a period of 12 months in our tertiary care center. Both the approval of local Institutional Review Board and written informed consent of all participants were obtained prior to the study. All HCWs affiliated with our university hospital were invited for enrolment in the study. The routine diagnostic laboratories included the departments of microbiology, immunology and serology. Consequently, a total of 100 adult volunteers were included in this study. Exclusion criteria comprised of a positive history of active TB, a history of household contact with TB patients, clinical evidence of active TB, use of immunosuppressive medications, malnutrition, pregnancy and poor general condition. All participants were informed about the goals of the study and procedures. All results collected within the context of this study were kept confidential. Interviews were made by means of a standardized questionnaire which provided information on demographic data including age, gender, education level, current workplace and duration of work in the healthcare service as well as data on former BCG scars. The questionnaire was reviewed by an expert panel for suitability and efficacy. A pilot study was conducted on 10 randomly selected personnel who were excluded from the main study. TST was performed by trained nurses according to the World Health Organization standard Mantoux technique, using 2 tuberculin units (0.1 ml) of purified protein derivates RT 23 on the volar surface of forearm. The test was read 72 hours later using 10-mm diameter as the cut-off point. For patients that do not display enduration after 72 hours, a second TST was performed to eliminate booster phenomenon. QFT-GIT test was performed in those with a positive TST test, considering the 0.35 IU/mL concentration of interferon-γ as the negative/ positive cut-off to confirm LTBI. To rule out active TB, lung X-ray was performed; if necessary sputum analysis was made for identification of acid-fast bacilli. As described by Hassan and Diab , the QFT-GIT test was administered in accordance with the instructions of the manufacturer (Cellestis Ltd., Carnegie, Australia). In this purpose, peripheral venous blood samples of 3 ml were collected from antecubital veins into three heparinized 1 ml tubes. One of these tubes which contained heparin only served as negative control, while the second tube containing the T cell mitogen phytohemagglutinin was the positive control. The third tube included the peptides ESAT-6, CFP-10 and TB7.7. Following incubation at upright position at 37°C for 24 hours, centrifugation was made for 15 minutes at 3000 rpm. The supernatant was frozen at -20°C for further analysis. The secretion of interferon-γ in response to MTB peptides was evaluated by an enzyme-linked immunosorbent assay. The results were calculated by means of the QFT software 2.23 and interpreted as positive if the level of interferon-γ was at least 0.35 IU/ml. Data was analysed via Statistical Package for Social Sciences program version 15.0 (SPSS Inc., Chicago, IL, USA). Normal distribution of variables was assessed with Kolmogorov- Smirnov test and parametric tests were used for variables with normal distribution, while non-parametric tests were utilized for variables without normal distribution. Two dependent groups were compared with Independent Student t and Mann- Whitney U tests. One way ANOVA test was utilized for comparison of more than 2 groups without normal distribution. Correlation between variables with normal distribution was evaluated with Pearson Correlation test, while Spearman’s rho test was used for assessment of variables that do not display normal distribution. Pearson Chi-square test was used for comparison of categorical variables. Quantitative variables were expressed as mean, standard deviation or as median, interquartile range, minimum and maximum values. Logistic regression was performed for multivariant analysis. Level of significance was set at p value<0.05. The study population consisted of 75 women (75%) and 25 men (25%) with an average age of 31.07 (range, 23 to 47) years. Of the 100 participants, 48% were doctors, 25% were nurses, 20% were laboratory personnel and 7% were cleaners. The average duration of work was 6.62 (range, 1 to 23) years. Positivity for TST was 42% in the whole population. As demonstrated in Figure 1, rates of TST positivity in doctors, nurses, laboratory persoennel and cleaners were 41.7%, 52%, 40% and 14.3%, respectively. No statistically significant difference was detected between occupations with respect to TST positivity. Figure 1. 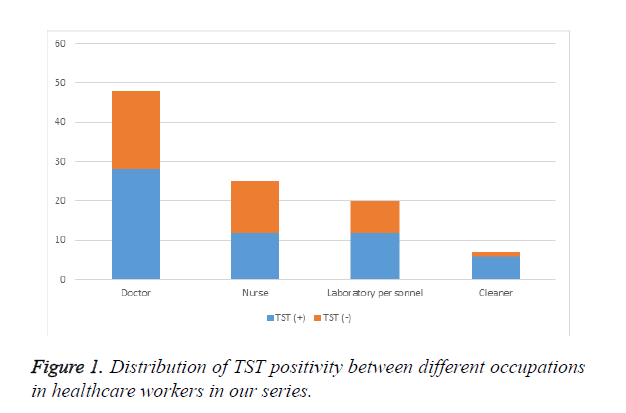 Distribution of TST positivity between different occupations in healthcare workers in our series. Rate of QTF-GIT test positivity was 23% in our series, while it was 22.9% in doctors, 24% in nurses, 15% in laboratory personnel and 13% in cleaners (Figure 2). There was no statistically significant correlation between occupations in terms of the results of QTF-GIF test. Increased number of BCG scars was accompanied by a larger diameter of enduration in TST (r=0.266, p=0.007). However, no remarkable association could be established between positivities of BCG and TST (p=0.46) (Table 1a). Analysis of the link between BCG and QTF-GIT indicated that there was no noteworthy correlation between BCG and QTF-GIT (p=0.07) (Table 1b). Our results have shown that concordance between QTF-GIT and TST was 65.2%. Sensitivity of the test was low (35.7%), while its specificity was higher (86.2%) (Table 2). Similarly, there was no correlation between duration of work and TST positivity (p=0.608) as well as duration of work and QTF-GIT (p=0.26). Figure 2. Distribution of QTF-GIT positivity between different occupations in healthcare workers in our series. Table 1A. Results of TST with respect to presence of BCG scar. Table 1B. Results of QTF-GIT with respect to presence of BCG scar. Table 2. Distribution of TST and QTF-GIT test results in our series. A correlation was noted between positivites of TST and QTF-GIT (r=0.310; p=0.002). The mean diameter of PPD enduration in patients with negative QTF-GIT results was 11.0 mm, whereas it was 15.4 mm in QTF-GIT positive cases. Thus, diameter of enduration was increased in patients with positive QTF-GIT results. None of the parameters such as age, gender, occupation, duration of work and features of BCG scars were associated with TST positivity (Table 3). Of these aforementioned variables under investigation, only gender was found to be linked with QTF-GIT positivity (Table 3). Table 3. Assessment of the association between possible risk factors, TST and QTF-GIT with logistic regression. The aim of the present study was to compare the efficacies of TST and QTF-GIT in diagnosis of LTBI in HCWs. Since TST is prone to be influenced by NTM and BCG vaccine, QTF-GIT seems to be a promising alternative in this purpose. In HCWs, the risk of TB infection is amplified owing to the increased exposure to patients with infectious disease, insufficient use of protective equipment, working in poorly ventilated areas and conduction due to exposure to contaminated aerosols . The present study provides information on the prevalence of LTBI in HCWs at a tertiary care center using both the TST and QFT-GIT tests. We determined 42% positivity for TST and 23% positivity for QTF-GIT in HCWs and these rates are remarkably higher than the recent report by Guanche et al. who concluded that positivities of TST and QTF-GIT were 6.9% and 3%, respectively . This obvious difference can be attributed to the demographic, ethnic and environmental features of the study populations worldwide. The variables likely to affect transmission of TB infection in healthcare facilities include the incidence of disease, compliance with principles of infection control and the effectivity of administrative controls . The relationship between LTBI and age, previous contact with TB patients and history of travel to countries with a high incidence of TB incidence have been previously reported [5,17]. These reports implied that contact with TB patients, prolonged experience of working in healthcare and being born in countries with high TB incidence were predictors of LTBI [4,17]. Another publication from Spain demonstrated that age and contact with TB were the main risk factors linked with LTBI in Spanish HCWs . In this aim, they have utilized QFT-GIT test, while results of TST did not indicate any relationship with parameters under focus. Similar to their findings and report by Guanche et al. we did not come across an association between the variables under investigation and TST results [3,18]. A considerable amount of population in Turkey received BCG vaccine and this point must be taken into account during interpretation of our results. However, a vaccine effect is rather unlikely since there is a cut-off point for diagnosis of LTBI . Currently, a growing awareness on the topic of nosocomial TB can be mentioned and this issue arises the need for protection of HCWs the era of multidrug-resistance . Even though studies in industrialised countries demonstrate that annual TST conversion rates range from 0.1% to 2% among unexposed personnel and from 0.5% to 14% among highly exposed HCP, the problem is more apparent and severe in developing countries . Therefore, popularization and effective implementation of programs for screening and treatment of LTBI especially among HCWs are crucial steps. These interventions must be carried out in conjunction with other measures targeting to reduce the risk of nosocomial transmission . The possibility of developing active TB during the first two years subsequent to a positive IGRA is lower for HCWs workers than for close contacts in the general population. This finding can be attributed to the fact that HCWs may have a low incidence of risk factors for developing active TB such as alcoholism and homelessness. Hence, a positive IGRA in HCWs is often associated with a remote LTBI with a low risk of progression . Based on the results of the current study and in view of the high rates of positivity for both TST and QTF-GIT in HCWs, efforts must be spent for elimination of risk factors for TB infection, screening, timely and diagnosis and effective management of LTBI. Thus, both health of HCWs and general population will be improved and decreased incidence of TB infection will be accomplished. Since the incidence of TB can influence the outcome of the screening test, a high rate of positivity for skin test results can be expected in countries with high endemicity and relatively high coverage of immunization. From this point of view, QFT-GIT may have a potential as a diagnostic tool instead of TST particularly for diagnosis of HCWs under risk for LTBI. Louther et al. have shown that TST positivity was more frequent in older patients, female gender and those with a history of BCG vaccination . We noted that diameter of induration in TST was larger in case of increased number of BCG scars. However, no significant correlation could be established between BCG positivity and TST positivity. These results may be linked with our relatively small sample size. In accordance with the publication by Brock et al, we did not observe an association between history of BCG vaccination and QTF-GIT . This finding may be due to the absences of antigens such as ESAT-6, CFP-10 ve TB7.7 in BCG. In our series, the highest rates of TST positivity were encountered in nurses (52%). This may ensource from the fact that exposure by close contact may bring about a higher risk for dissemination of TB in HCWs. Our results imply that TST is a safe and practical method with no evidence for any allergic reactions in our series. On the other hand, the use of IGRA in TST-positive cases reduces the likelihood of false positivity linked with exposure to atypical mycobacteria or BCG vaccination. However, both the TST and IGRA tests possess restrictions for diagnosing LTBI. The main problems with TST consist of technical limitations, difficulty in interpretation of results and occurence of substantial amount of false positive results . Even though IGRA tests are more specific than TST, they are expensive and challenging results can be seen for results near the cut-off point between positive/negative outcomes . Hence, a cost-effective selection must be made for diagnostic measures in order to optimize costs and increase the level of diagnostic accuracy. Our findings support the idea that TST should not be the only diagnostic clue to rely on for confirmation of LTBI diagnosis in populations with a high BCG vaccination coverage . It is obvious that HCWs in countries with increased burden of TB face a risk of exposure to TB and improvement of working conditions, provision of appropriate personal protection equipment and meticulous infection control programs must be employed to combat with transmission of TB. Main limitations of the current study consist of data limited to experience of a single institution, relatively small sample size, impact of BCG vaccination on results and lack of analysis for known exposure to TB. Moreover, impacts of the environmental, genetic, ethnic and socioeconomical variables cannot be ignored. Thus, associations and interpretations must be made with caution. Nevertheless, the information extracted from the present study is valuable to outline the prevalence and identify the factors linked with LTBI. We suggest that QTF-GIT test can be placed in the diagnostic armamentarium used in national TB control program. In conclusion, we suggest that IGRAs such as QTF-GIT test can be an effective diagnostic option for LTBI in countries with high prevalences of NTM and high rates of BCG vaccination. Healthcare workers should be closely monitored for LTBI since they are under substantial risk due to the close contact with TB patients. Lamberti M, Muoio M, Monaco MG, Uccello R, Sannolo N, Mazzarella G. Prevalence of latent tuberculosis infection and associated risk factors among 3,374 healthcare students in Italy. J Occup Med Toxicol 2014; 9: 34. Baussano I, Nunn P, Williams B, Pivetta E, Bugliani M, Scano F. Tuberculosis among health care workers. Emerg Infect Dis 2011; 17: 488-494. Guanche GH, Crespo RE, Kindelan CA, Gutierrez GF. Latent tuberculosis infection in healthcare workers at a community hospital in Qatar. J Infect Public Health 2014; 7: 356-359. Lee K, Kyoung Han M, Ran Choi H, Choi CM, Oh YM, Do Lee S. Annual incidence of latent tuberculosis infection among newly employed nurses at a tertiary care university hospital. Infect Control Hosp Epidemiol 2009; 30: 1218-1222. Khanna P, Nikolayevsky V, Warburton F, Dobson E, Drobniewski F. Rate of latent tuberculosis infection detected by occupational health screening of nurses new to a London teaching hospital. Infect Control Hosp Epidemiol 2009; 30: 581-584. Global Tuberculosis Report, 2012. Geneva, Switzerland: World Health Organization; 2012. Vinnard C, Linkin D, Behrman A. Current approach to latent tuberculosis diagnosis and treatment among medical center occupational health physicians. Infect Control Hosp Epidemiol 2012; 33: 1262-1265. González DA, Sánchez VL, Armas PL, Rodríguez VL, Salgado VA, Borrero PH. Trends and predictions of tuberculosis, and challenges towards tuberculosis eradication in Havana City. Rev Cubana Med Trop 2012; 64: 163-175. Hassan MI, Diab AE. Detection of latent tuberculosis infection among laboratory personnel at a University Hospital in Eastern Saudi Arabia using an interferon gamma release assay. J Infect Public Health 2014; 7: 289-295. Kaufmann SH, Winau F. From bacteriology to immunology: the dualism of specificity. Nat Immunol 2005; 6: 1063-1066. Vukmanovic-Stejic M, Reed JR, Lacy KE, Rustin MH, Akbar AN. Mantoux Test as a model for a secondary immune response in humans. Immunol Lett 2006; 107: 93-101. Menzies D, Pai M, Comstock G. Meta-analysis: new tests for the diagnosis of latent tuberculosis infection: areas of uncertainty and recommendations for research. Ann Intern Med 2007; 146: 340-354. Huebner RE, Schein MF, Bass JB. The tuberculin skin test. Clin Infect Dis 1993; 17: 968-975. Pai M, Zwerling A, Menzies D. Systematic review: T-cell-based assays for the diagnosis of latent tuberculosis infection: an update. Ann Intern Med 2008; 149: 177-184. Diel R, Goletti D, Ferrara G, Bothamley G, Cirillo D, Kampmann B. Interferon-γ release assays for the diagnosis of latent Mycobacterium tuberculosis infection: a systematic review and meta-analysis. Eur Respir J 2011; 37: 88-99. Saleiro S, Santos A, Vidal O, Carvalho T, Torres Costa J, Marques JA. Tuberculosis in hospital department health care workers. Rev Port Pneumol 2007; 13: 789-799. Borroto S, Gámez D, Díaz D, Martínez Y, Ferrer AI, Velásquez Y. Latent tuberculosis infection among health care workers at a general hospital in Santiago de Cuba. Int J Tuberc Lung Dis 2011; 15: 1510-1514. Alvarez-León EE, Espinosa-Vega E, Santana-Rodríguez E, Molina-Cabrillana JM, Pérez-Arellano JL, Caminero JA. Screening for tuberculosis infection in Spanish healthcare workers: comparison of the QuantiFERON TB Gold in Tube test with the tuberculin skin test. Infect Control Hosp Epidemiol 2009; 30: 876-883. Nienhaus A, Kesavachandran C, Wendeler D, Haamann F, Dulon M. Infectious diseases in healthcare workers - an analysis of the standardised data set of a German compensation board. J Occup Med Toxicol 2012; 7: 8. Joshi R, Reingold AL, Menzies D, Pai M. Tuberculosis among health-care workers in low- and middle-income countries: a systematic review. PLoS Med 2006; 3: e494. Nienhaus A, Schablon A, Preisser AM, Ringshausen FC, Diel R. Tuberculosis in healthcareworkers - a narrative review from a German perspective. J Occup Med Toxicol 2014; 9: 9. Louther J, Rivera P, Feldman J, Villa N, DeHovitz J, Sepkowitz KA. Risk of tuberculin conversion according to occupation among health care workers at a New York City hospital. Am J Respir Crit Care Med 1997; 156: 201-205. Brock I, Weldingh K, Lillebaek T, Follmann F, Andersen P. Comparison of tuberculin skin test and new specific blood test in tuberculosis contacts. Am J Respir Crit Care Med 2004; 170: 65-69. Hung WT, Lee SS, Sy CL, Wu KS, Chen JK, Tsai HC, Chen YS. Prevalence of latent tuberculosis infection in BCG-vaccinated healthcare workers by using an interferon-gamma release assay and the tuberculin skin test in an intermediate tuberculosis burden country. J Microbiol Immunol Infect 2015; 48: 147-152.